This new bar from Marks and Spencers is just pretty. That is why I picked it up, it just looked so lovely on the shelf. 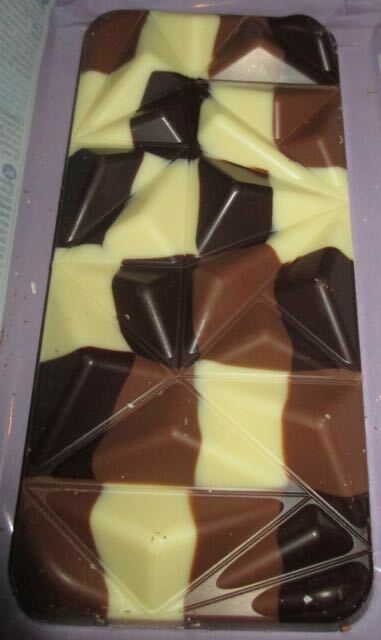 There are three chocolate varieties and they are all marbled into the bar, and the bar is a set out like a series of peaks. Visually it is pretty stunning. The ingredients are just white, milk and dark chocolate but the presentation of them means that each mouthful of the chocolate gives you a slightly different combination of flavours. Admittedly the peaks of chocolate make it a bit difficult to share out the pieces, but I’m happy to forego this as I like the design so much. The white chocolate is so creamy and sweet, it is a proper soothing chocolate.The dark has a lovely bitter tang and the milk chocolate has a good cocoa flavour with a creamy edge. Allof the chocolates are smooth and thick when they melt, clearly of very good quality. The different combinations of these chocolates is a pleasure too. A dark piece with a bit of white choclate brings balance for example. This makes the bar interesting to eat too. Ok hands up I like novelty, and this bar comes with plenty of that. On a more practical note it would make a fab stocking filler. The chocolates aren’t flavoured so it is easy to eat, and it will make people smile if they receive it as a gift.